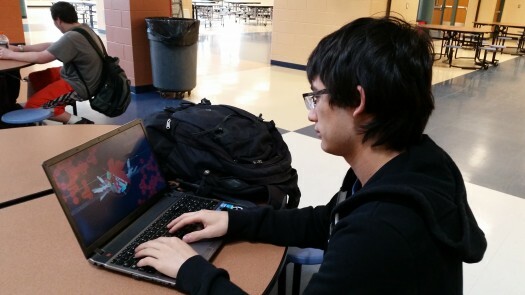 Junior Roger Detzler working on his laptop. Introduction: MOOCs are Massive Open Online Courses. Leading Platforms: The leading MOOC platforms are Coursera, edX, and Udacity. This article also discusses Khan Academy, the Big History Project, and MIT Open Courseware. Pros of MOOCs: MOOCs allow “non-traditional students” to receive some form of education, they allow for passionate learners to continue learning, and enhance student engagement. Cons of MOOCs: MOOCs by nature do not allow for individualized education, cheating is rampant, and, on average, only 1 out of 10 students successfully complete MOOCs. NH Primary MOOC: Political scientists from UNH are designing an MOOC focused on the historical and political context of the New Hampshire primary, just in time for the 2016 election. Imagine having free access to college courses from MIT, Harvard, Stanford, or Duke. Is there a particular subject that intrigues you, such as the science of black holes, the cyberpolitics of international relations, or the the global business of sports? Ever heard of a course tying together globalization and theater, or cosmology and anthropology? MOOCs, or Massive Open Online Courses, provide students, regardless of age or socioeconomic status, access to online college courses taught by professors from a wide range colleges and universities, free of charge. MOOCs are free, online courses where students can register without a financial risk for as many courses as they want. The vast majority of MOOCs originate from top universities. Most MOOCs have around 100,000 students enrolled in the programs, making them far-reaching but impersonal. A typical MOOC lasts 8 – 10 weeks, and features short lectures (the median time is 11 minutes per lecture, according to Ideas.Ted.com). Coursework generally entails watching the lectures, outside readings, short quizzes, final exams, and peer discussions, however, specifics depend on the platform and nature of the MOOC. Not only do MOOCs allow so-called “non-traditional” students to have access to university classes, but individuals who are passionate about a certain subjects can pursue those interests by completing MOOCs. There are several types of MOOCs: a xMOOC, the most common type, is organized around a professor and core curriculum; a cMOOC attempts to simulate a college seminar, where the class is based on online forum discussions; Corporate MOOCs are designed for employee training. This article will focus on xMOOCs, as they are the most relevant to high school students. MOOCs began as Open Online Courses (OOCs), where professors used the internet to present an open education experience, according to Fad or Future: The Advantages and Challenges of MOOCs. OOCs eventually evolved into massive open online courses when the Canadian professors Siemens and Downes created a “Connectivism and Connective Knowledge” online course (view here: CCK08) in 2008. Unlike prior OOCs, over 2,200 students signed up for the online course, thus transforming it into mass education. Four years later, Coursera, today’s leading for-profit platform for MOOCs, began to coordinate existing OOCs and MOOCs. Coursera was developed by Stanford computer science professors Andrew Neg and Daphne Koller. Simultaneously, Thurn and Norvig launched an online Artificial Intelligence course (view here: CS221), which evolved into Udacity in 2012, another leading, for-profit MOOC platform aimed at providing lifelong learning, primarily in computer science and math. Today, there are over 1,200 MOOCs available, from humanities to science and math (see chart for breakdown). Roughly 40% of students who take MOOCs are from developing countries. However, MOOCs are far from revolutionizing higher-education by making them available to all students – 30% of MOOC students have a bachelor’s degree and 34% have a master’s degree. Several experts note that the students who gravitate towards MOOCs are motivated individuals who are passionate about learning, not necessarily those living in poverty in a third world country. Completion rates are pitiful as well – according to an article by the Economist, The Digital Degree, only 10% of students who start a MOOC successfully complete it. The leading platforms for MOOCs are Coursera, Edx, and Udacity. These platforms allow all students to take any course they’d like for free, and if they pay, they can receive a certificate that some colleges award credit for. Khan Academy, the Big History Project, and MIT Open Courseware are other notable platforms that do not offer credit, but many curious individuals use them to learn and explore their passions. Coursera is the leading, for-profit MOOC platform. 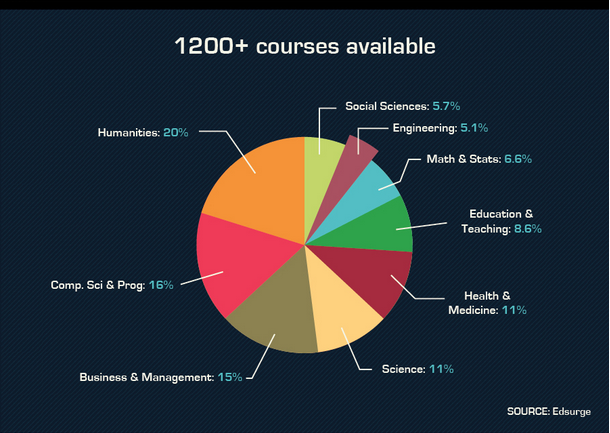 Coursera has partnered up with 107 schools, has over 5 million students, and offers 532 courses. According to their website, Coursera’s goal is to “…provide universal access to world’s best education, partnering with top universities and organizations to offer courses for anyone to take, for free.” Coursera’s offers a variety of courses (you can view their course catalogue here), ranging from a comprehensive series of classes about American healthcare to Cryptography. Obtaining college credit from Coursera courses became a viable option in 2013. According to an article by the New York Times, the Antioch University of Los Angeles offers students college credit for completing Modern and Contemporary American Poetry and Greek and Roman Mythology. Furthermore, the American Council on Education agreed to have experts assess whether individual Coursera courses are credit worthy – if they’re deemed to be worthy of college credit, students who pay a fee and take an identity-verified exam can obtain an ACE credit transcript, which 2,000 universities already accept (a list of colleges that accept ACE credits can be viewed here). EdX is a non-profit MOOC platform developed by MIT and Harvard in 2012. 1.65 million students from 225 countries and territories have taken or are currently taking an edX MOOC and 125 courses are offered. According to their website, “EdX was created for students and institutions that seek to transform themselves through cutting-edge technologies, innovative pedagogy, and rigorous courses.” Their goals include “advancing teaching and learning through research” – because thousands of students are taking hundreds of courses, MIT and Harvard accumulate reams of data, which they can us analyze to understand how students learn. Their course catalogue can be viewed here, and like Coursera, edX offers a wide variety of disciplines. While the vast majority of universities do not accept edX credits, the John F. Kennedy University in California does accept edX MOOC credits toward their degrees. Udacity focuses on math and computer science MOOCs, has 1.8 million students from 190 countries, and offers 33 courses. Udacity, unlike Coursera and edX, offers a “nanodegree program” alongside traditional MOOC courses. The nanodegree program is a web-based curriculum that students can complete in 6-12 months (10 hour work week), according to Udacity’s website. Currently, there are five nanodegree programs: front-end developer, full stack developer, introduction to programming, data analyst, and iOS developer. To convey competence in one of the five programs, students need to complete its component courses, as well as periodic projects. After completing the course, students compile their projects into a portfolio that they can then market to potential employers. Khan Academy is an online video archive of lessons, with topics ranging from math to the humanities. The site, created by Salman Khan, began as a series of YouTube videos Khan made for his cousins to help them with math. Today, Khan Academy has it’s own site and over 5,000 free, web-based video lessons for students. According to an article written by the Harvard Business Review, Khan Academy is personalized in that the “…technology can deliver information at a student’s pace, give practice problems and feedback, and arm teachers with data.” Each student can learn at their own pace, whether they’re doing it independently or for a class, and master content before moving on. Khan Academy has short 5 – 10 minute videos, which are often followed by practice questions and games to check for comprehension. Like other MOOC platforms, Khan Academy embraces the ideas of short segments, rather than long, one-hour long lectures. According to Khan, “…humans can pay attention for 10 – 15 minutes before they zone out. You zone back in for eight or nine minutes, then you zone out again…by the end of the hour you might have picked up 30% of the material.” By having short videos and comprehension checks, Khan believes that students can stay engaged for the duration of the lesson. “Big History” originated as a course taught by Australian professor David Christian. He taught it both in person and as a “Great Courses” class (“Great Courses” are a series of lectures on DVDs that students can purchase). The main idea of “Big History” is that history, cosmology, evolution, and anthropology cannot be taught independently, as they are done in most schools, but rather, they should be woven together into a narrative of life on Earth, so students can see the connections between subjects. It has now evolved from a college course to a MOOC, with its own website and graphic design team, with the funding of Bill Gates. 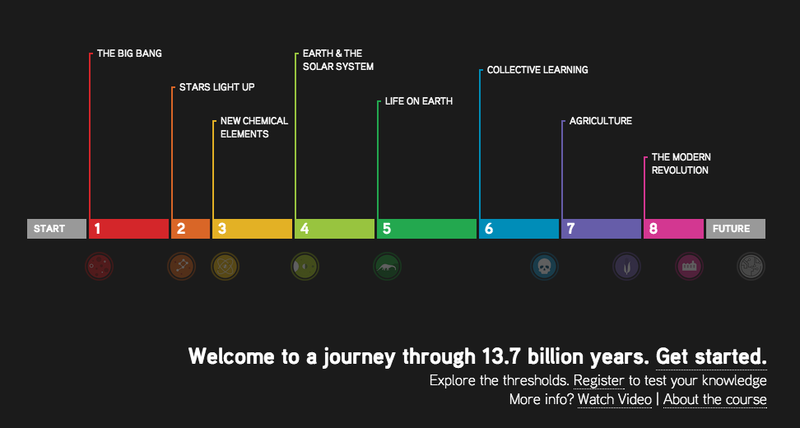 Christian divides “Big History” into eight thresholds, from the Big Bang (#1) to the emergence of the Homo sapiens (#6), the appearance of agriculture (#7), to our modern world (#8) (see the image for all the thresholds). Bill Gates, an advocate for education reform, saw the idea when watching the lectures via Great Courses and loved it. He contacted Christian, and offered to fund the project. After adapting it to a high school curriculum, Gates and Christian designed an electronic textbook, with interactive videos, timelines, and graphics. Free of charge, Gates pitched it to five schools in 2011. The figure grew to 15,000 students in 1,200 schools in 2014, and the University of California system announced that the Big History course was the equivalent to a traditional World History course. For example, Big History fuses history and astronomy together in the Big Bang lecture by providing a comprehensive history about cosmology, both the historical aspect (from Ptolemy’s geocentric model to Hubble’s idea of our expanding universe) and the scientific aspect (the technicalities of how the universe came into existence). There is no mention of the robber barons in the Big History Project, however, Gates does briefly state the issues of unequal resource distribution. MOOCs & Traditional Classes: Dominate, Fade Out, or Hybrid? The merit of MOOCs are that they provide education and knowledge to any willing student. They’re free to all, unless one is looking to pursue a certificate of accomplishment or college credit, and they’re flexible, making it ideal for both traditional and nontraditional students. While making an individual MOOC is expensive (roughly $300,000 per course, according to the National Educational Association [NEA]), because roughly 100,000 students take the courses, it ends up being very cheap on a per student basis ($3 per student). MOOCs also have instant feedback through machine grading, which is very beneficial to many students. However, as mentioned earlier, completion rates are very low. This is partially attributed to the fact that there are fewer social connections, so many students can lose their motivation early. Furthermore, MOOCs aren’t appropriate for interactive classes, such as the lab sciences, as they would be significantly lacking any necessary hands-on experience. Furthermore, on several platforms, cheating is problematic – there is no mechanism put forth to avoid it, like in a traditional classroom, and peer-graded, rather than teacher-graded essays worsens the issue. Because MOOCs are “mass education,” by nature it isn’t individualized and tailored to each student’s needs. Until companies and institutions have enough data to tailor classes, students will have to adjust to the teaching styles available. Lastly, MOOCs lack the personal connection between peers and teachers that a traditional classroom has. According to John Henry Newman’s famous 1985 paper, The Idea of a University, the post-Enlightenment university is “a place for the communication and circulation of thought.” While forums can partially facilitate this, it cannot be replicated perfectly. This is a large reason why MOOCs cannot replace formal college education. Many teachers and professors have been experimenting with hybrid MOOCs, where the MOOC courseware is used as a supplement to a course, similar to a textbook. This method is very popular at MIT; according to the Economist, roughly 50% of students at MIT take a MOOC as part of their course. By nature, Khan Academy and the Big History Project are hybrid MOOCs: Khan Academy is popular amongst teachers who embrace the “flipped classroom model” (where students learn the material at home then discuss it in class) and the Big History Project is a digital textbook to supplement lectures and in-class activities. Jake Poirier, a junior, has experience with two MOOCs: Honors American History (sophomore year) and AP Computer Science (currently). AP Computer Science was referred to Poirier by a friend, and he stated that he liked the MOOCs because “…you can go at your own pace.” The downside for him was the heavy time commitment, which is a common issue with MOOCs for several students. Poirier takes his classes through VLACS, so he is only able to take high school classes. He “…would recommend VLACS because…there are a number of systems put in place for convenience, and it has ties to EHS.” Poirier recommends AP Computer Science to any students interested in taking a MOOC. Roger Detzler, a junior, is planning on taking the Modern Musician certification by Berklee College of Music via Coursera. The Modern Musician certification entails three separate courses: (1) Developing Your Musicianship, (2) Introduction to Music Production, (3)Songwriting. Similar to Udacity’s nanodegree program, Coursera’s Modern Musician certification allows students to practice their musical skills and learn the theory behind it, then submit a final project. For the Modern Musician certification, the final project entails (1) writing a song, (2) creating a production plan for the song, (3) recording, editing, and arranging the production of the song, and (4) mixing and submitting the song. Detzler is passionate about music, and he hopes to obtain a certification and learn about “…sound engineering, a field that has very few courses.” Furthermore, Detzler states that “…it offers [him] an opportunity to take a course that doesn’t really exist anywhere else, taught by a college professor, and for a fraction of the university sticker price. Music technology is a very new industry that has made very little ground in terms of education, and it’s exciting to see that MOOCs…are enabling them to become more accessible.” Detzler plans on completing the specialization (all three courses plus the final project) during one of his free periods next year. During the past summer, I took an Introduction to Astronomy course, by Duke University, through Coursera. I personally found the wide array of courses offered by Coursera fascinating, and it took me a couple of days to narrow down my list of 20 potential courses I could take to just one. I took the course without a certificate (so I didn’t get any credit), but the learning experience was enthralling. Because I took the archived course, I missed out on the peer interaction, but I found the lectures engaging and the outside reading (outside readings were links to various informational websites) was interesting. I’m interested in space science, so I took the MOOC to expand my horizons and learn more about the universe – it was solely a recreational option for myself. I loved how it was self-paced, and it’s flexibility allowed me to work it into my summer schedule. I found the material engaging enough to keep me going, so I rarely fell behind in the course. The only downside for me is the fact that learning is primarily through video lectures – personally, I prefer to learn by reading. However, that’s more of an individual thing, so I 100% recommend this course to anyone who has the time and some interest in the cosmos. The course covered the solar system, stars, cosmology, erratic objects like black holes and quasars, as well as the basic ideas of Einstein’s theory of relativity. It’s not very math intensive – the only math you’d need is basic algebra – a solid understanding is not imperative to success in this course. During this summer, I plan on taking Wellesley’s Global Sociology course through edX. Are you a political junkie, journalist, government nerd, or educator? If so, you must be eagerly anticipating the 2016 general and primary elections. Two political scientists, Andrew Smith and Dante Scala from the University of New Hampshire are also excited. They’re so excited that they’re currently working on an MOOC focused solely on the New Hampshire primary election. The course is expected to launch in mid-October. The MOOC will be be 6-7 weeks long, featuring one-hour long lecture segments three days a week. UNH students will be able to take the class in-person in the fall for college credit. This is an opportunity for students to have a “…front row seat to the primary that historically sets the tone for the rest of the nation,” according to Smith. MOOCs will not destroy upper education as many contend, however, it will alter the structure of upper education. The most likely outcome is professors blending MOOCs with their previous curriculum. With the reams of data accumulated by MIT, Harvard, and other MOOC providers, researchers and teachers will be able to focus on how students learn, and use the data to improve teaching techniques. MOOCs are revolutionizing education by opening it up to thousands of individuals. Now, disadvantaged students from around the world can receive unparalleled education for little to no money. Individuals with passions can pursue them through MOOCs. Teachers can use them to “flip the classroom,” thereby ensuring the most effective usage of class time. Get ready for the last feature of the year, the Psychology of Learning #4: A Global Perspective, which will focus on the U.S.’ education system compared to other countries. Have any suggestions for next year? Comment below, and I’ll look into it.